In September 2010, Farrah joined the Kimani Romance family with the launch of her new series that follows the life of the fictional New York Sabers football team. 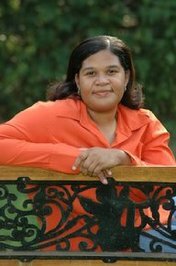 When she is not wr A native of south Louisiana, Farrah Rochon officially began her writing career while waiting in between classes in the student lounge at Xavier University of Louisiana. After earning her Bachelors of Science degree and a Masters of Arts from Southeastern Louisiana University, Farrah decided to pursue her lifelong dream of becoming a published novelist. She was named Shades of Romance Magazine's Best New Author of 2007. Her debut novel, Deliver Me, the first in her Holmes Brothers series, garnered rave reviews, earning Farrah several SORMAG Readers' Choice Awards. Is this you? Let us know. If not, help out and invite Farrah to Goodreads.